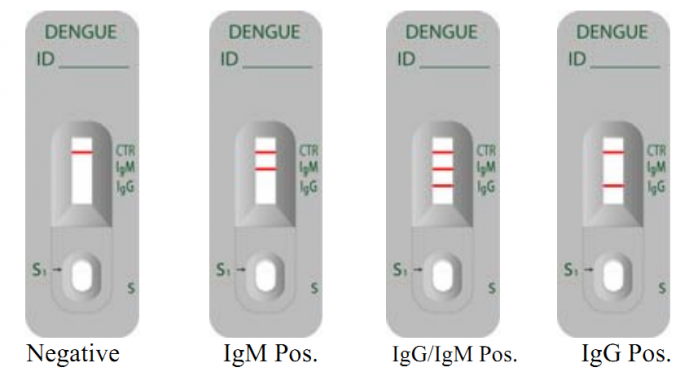 The Dengue IgG/IgM homeTest is a rapid immunochromatographic assay for the simultaneous detection of IgG and IgM antibodies to Dengue virus in serum or plasma. The assay is used as a screening test for Dengue viral infection and as an aid for differential diagnosis of primary and secondary infections in conjunction with other criteria. Dengue fever is one of the most important mosquito-borne diseases in the world in the terms of morbidity, mortality. Dengue fever virus (serotypes 1 – 4) belongs to the group flavivirus, and is transmitted in nature by day-biting Aceder mosquitoes. The most important mosquito vector is highly domesticated and urban species, Aedes aegypti. Primary Dengue infection, also known as Dengue Fever, is the most common type of dengue illness. 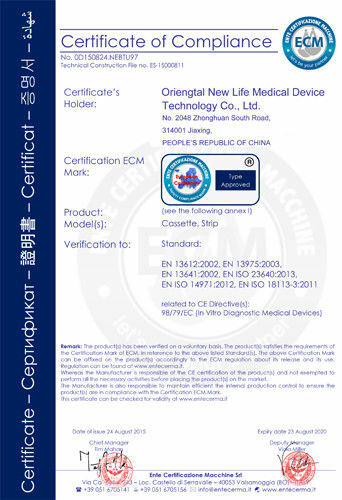 It is associated with mild to high fever, headache, muscle pain and skin rash. Secondary infection is known as Dengue Hemorrhagic Fever ( DHF ) or Dengue Shock Syndrome, and often results in high fever and in many cases, with hemorrhagic events and circulatory failure. The fatality rate in patients with Dengue Shock Syndrome can be as high as 44%. Dengue presents typically as a fever of sudden onset with headache, retrobullar pain, pain in the back and limbs (break-bone fever), lymphaderopathy and maculopaplar rash. Patients diagnosed with dengue in endemic areas generally have secondary infection, whereas patients in non-endemic areas are usually diagnosed with primary infection. Specific antibody responses to Dengue virus enable serodiagnosis and differentiation between primary and secondary dengue infections. 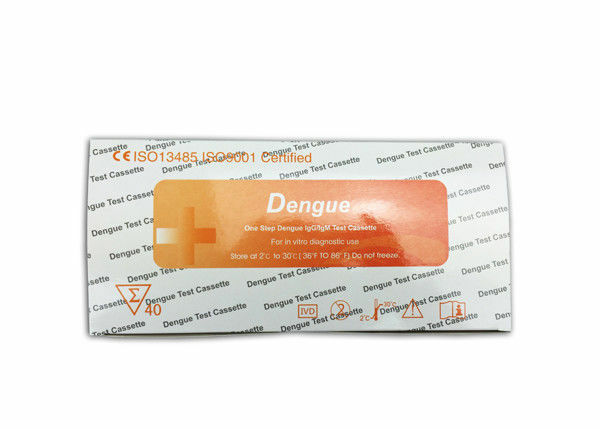 Dengue IgG/IgM Test is a new generation rapid Immunochromatographic test using recombinant dengue viral antigens of all four serotypes to detect specific antibody response. 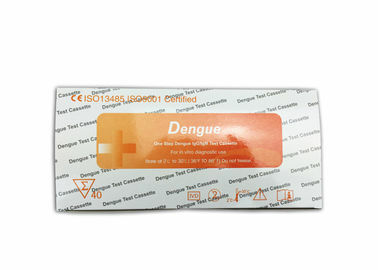 The Dengue Test utilizes the principle of Immunochromatography. 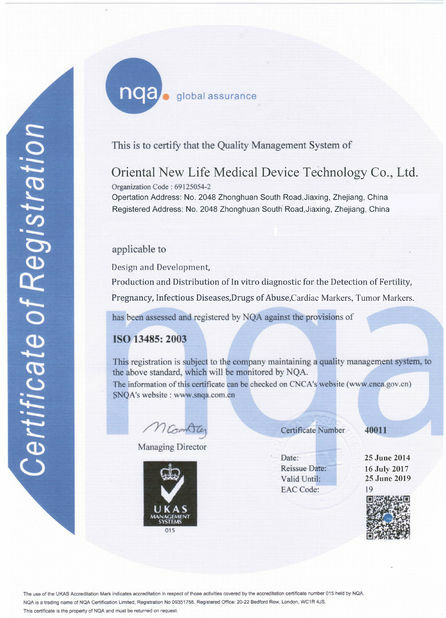 Mouse anti-human IgM and human IgG antibodies are immobilized on the nitrocellulose membrane respectively, as two individual test lines (IgM line and IgG line) in the test window of the test device. The IgG line in the test window is closer to the sample well and followed by IgM line. As the test sample flows through the membrane assembly within the test device, the colored–Dengue specific recombinant antigen-colloidal gold conjugate complexes with specific antibodies (IgM or IgG) of Dengue virus, if present in the sample. This complex moves further on the membrane to the test region where it is immobilized by the anti-human IgM and/or human IgG binding proteins coated on the membrane leading to formation of a colored band, which confirms a positive test results. Absence of this colored band in the test window indicates a negative test result. A built-in control line will always appear in the test window when the test has performed properly, regardless of the presence or absence of anti-Dengue virus antibodies in the specimen. Bring the kit components to room temperature before testing. Open the pouch and remove the Card. Once opened, the test card must be used immediately. Label the test card with patients identity. Apply 5 µL of serum or plasma to the “S1” area indicated by the arow mark. Add 2 to 3 drops of sample buffer to well marked as “S”. Please note that S1 and S are refering to the same well. At the end of 20 minutes read the results. A strong positive sample may show result earlier. The control line and IgG line (T1) are visible in the result window. The test is positive for IgG antibodies. This indicates a past dengue infection. The control line and IgM line (T2) are visible in the result window. The test is positive for IgM antibodies. This indicates a primary dengue infection. The control line, IgM (T2)and IgG (T1) lines are visible in the result window. The test is positive for IgM and IgG antibodies. This indicates a secondary dengue infection. The control line is the only line visible in the result window. No IgG or IgM antibodies have been detected. The result does not exclude dengue infection. If symptoms persist, a new specimen should be drawn from the patient in 3-5 days and then should be retested (see the limitations section).